Yet it is when the film dares to slow down -- and stops feeling like Lethal Weapon with a jazz score -- that we get to experience Davis in metaphoric repose, as the genius domesticated, and struggling with the freedom he demands for himself, but denies the woman whose own creative freedom is his inspiration. That is to say that so much of Miles Ahead is spent in the legendary West Side apartment of the trumpeter, where we initially find him alone wallowing in drug dependency and artistic exile, and in flashbacks, at the peak of his artistic power, under the care of his wife and dancer Frances Davis, portrayed by Emayatzy Corinealdi, who demands your attention in every scene she is in. As Cheadle explains, the flashbacks with Francis Davis offer some insight into the trumpeter’s “writer’s block,” where “Frances represents his muse, the voice he has lost and is trying to recapture.” In one of the character’s intimate interactions early in the film, Frances describes to Miles what she experiences while dancing on stage -- a sense of “falling” -- which in the movement of the film immediately translates into Miles’s creation of “Fran-Dance.” This scene is important because here Frances is not just some idealized feminine muse, but someone, who in the intimacy of the domestic space, Miles could envision as a creative equal. This pillow-talk discourse between two artists-as-lovers complicates, Hazel Carby’s well circulated readings of Miles Davis’s misogyny and physical abuse against his most intimate partners. As Carby writes in her book Race Men, “I think it is very important to challenge the apparent distance between Davis’s violence against women and the ‘genius’ of his music, as if they were enacted on different planes” (144). What Miles Ahead revisions, is not the reality of Miles’s violence -- the film makes explicitly clear Miles’s violence towards Frances -- but the extent that such abuse was more than the by-product of socially constructed gender expectations. Miles Davis’s marriage to Frances Davis coincides with what is generally regarded as the artist’s most accomplished period, inclusive of the career defining Kind of Blue (1959) and concluding with the breakup of his “second” great quintet that featured Herbie Hancock, Wayne Shorter, Tony Williams and Ron Carter. As was the case with Frances Davis, Miles Davis thrived in the intimacy of particularly strong Black women artists, including musician Betty Mabry Davis -- who emboldens Davis’s electric period -- and actress Cicely Tyson, who helps nurse Davis back to health when he re-emerges in the public eye in the early 1980s. Again this is not to obscure the violence; Frances Davis recalls “running for my life — more than once,” a moment that Miles Ahead captures, and Miles Davis himself narrates his brutality towards Tyson (if uncritically) in his autobiography (written with Quincy Troupe), inspiring Pearl Cleage to pen the essay “Mad at Miles,” to give clear Black feminist language to Davis’s violence and the silence surrounding it. Davis’s penchant for intimate partner violence might reveal, in part, the frustration that he aligned with the absolute need for Black women as artistic partners and equals, the inability to acknowledge as much given the gender mores of the times, and his own investment in the idea of the singular Black Male Genius. In this regard Carby is dead-on when she argues that Miles Davis sought “freedom from a confinement associated with women, and freedom to escape to a world defined by the creativity of men” (138). 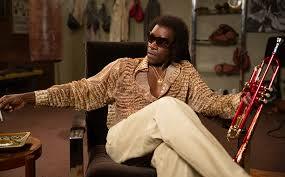 What Cheadle’s Miles Ahead makes plain is the extent that Miles Davis was dependent on the interiority of his art. As poet Elizabeth Alexander offers, the “The Black Interior is not an inscrutable zone, nor colonial fantasy. Rather, I see it as inner space in which black artists have found selves that go far, far beyond the limited expectations and definitions of what black is, isn’t or should be” (The Black Interior, 5). Indeed Miles Davis’s literal balancing act in the film between his rehearsal studio in the basement of his apartment, and the domestic drama above in the “home” with Frances Davis, highlights how fraught his art was with tensions of domesticity. At its core Miles Ahead illuminates how Miles Davis never resolved the anxieties associated with his need for the domestic as a province for the Black female genius that inspired him, while privileging of public articulation of the singular Black male creative genius. Mark Anthony Neal is Professor of African + African-American Studies and Professor of English at Duke University, where he directs the Center for Arts + Digital Culture + Entrepreneurship. He is the host of the video podcast Left of Black.